Parmigianino (1503–1540), The Mystic Marriage of Saint Catherine (detail) (c 1527-31), oil on wood, 74.2 × 57.2 cm, The National Gallery, London. Wikimedia Commons. By the late 1400s, the layered technique of oil painting which had originated in the north had become well established throughout Europe. Paintings normally started with an underdrawing, which could be made using a range of different media, from charcoal to egg tempera, over which thin layers of oil paint were applied, each being left to dry before the next was added. Oil paints used linseed or walnut oil as their binder, which could be thickened and pre-polymerised by heat treatment, to which small amounts of pine resin could be added as a thickener, and drying agents including lead or copper salts. Workshops were very skilled at producing paints of the right viscosity for the task, allowing for the different pigments in use. Painters had also developed ancillary techniques to enhance their work. Among these was the imprinting of patterns, typically of woven fabrics, in glaze layers, which was used to create some of the intricate details in texture of clothing and other materials. The period around 1500 saw several important developments which were to have lasting effects on the techniques of oil painting, and on paintings themselves. The first of these was the addition of paint to a paint layer which was still wet – known as wet-on-wet, wet-onto-wet, wet-in-wet, or wet-into-wet. When an oil layer is added wet-on-dry, no physical mixing or blending occurs between the layers, although optical blending is seen when the upper layer is at least partially transparent. Physical blending required partial drying of the lower layer so as to give the painter control over the process. 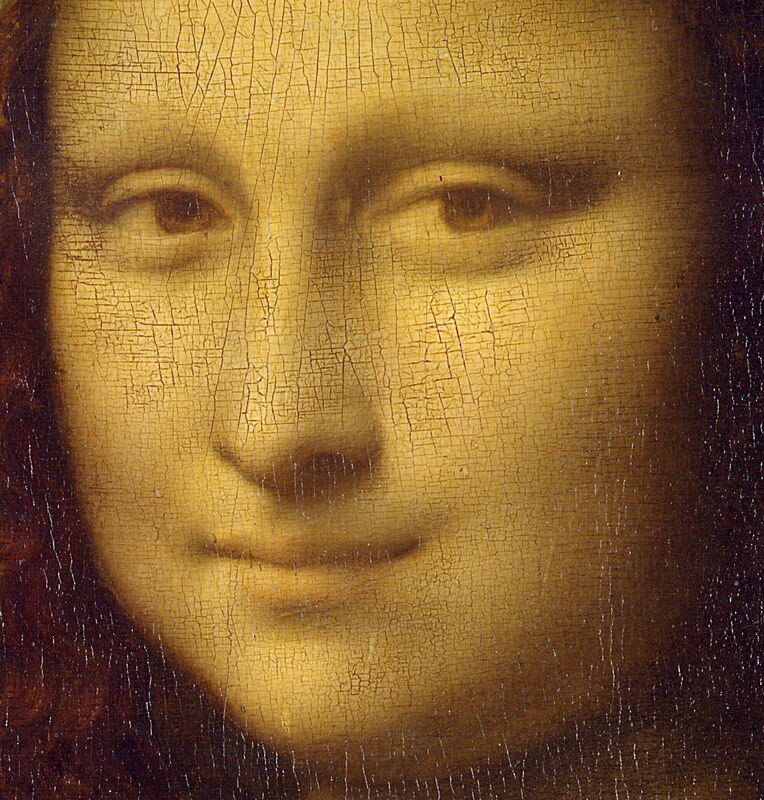 Although the most innovative and skilled artists like Leonardo da Vinci accomplished their soft blending, or sfumato, using mainly optical blending of wet-on-dry layering, physical blending by painting wet-into-wet became more widely used to soften colour and tonal transitions. This was not possible using the rapidly-drying medium of egg tempera, and was exploited by painters in oils to make more visible distinctions in the ‘look’ of their paintings. 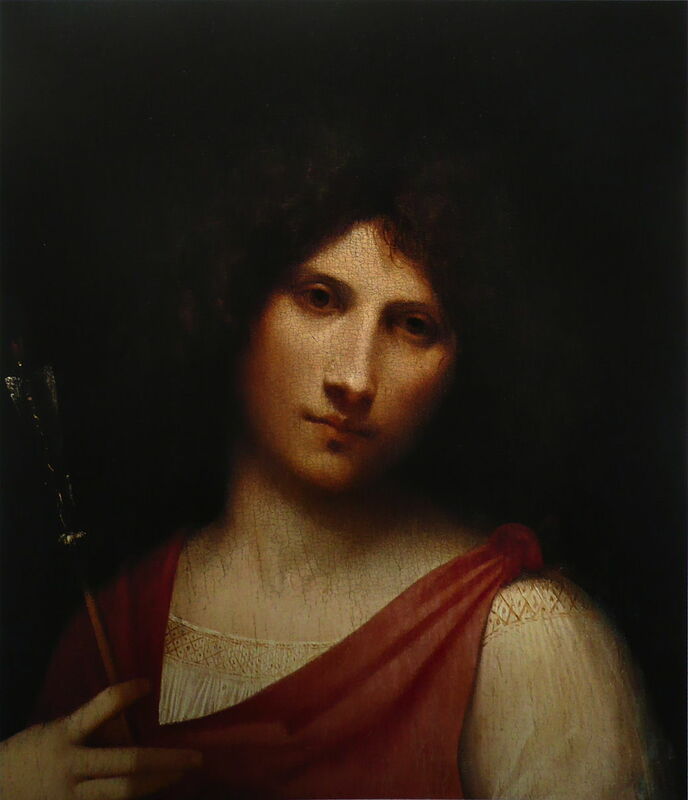 Giorgione (1477–1510), Boy with an Arrow (detail) (c 1500), oil on panel, 48 × 42 cm, Kunsthistorisches Museum, Vienna. Wikimedia Commons. At the same time that some painters were prolonging the production of their work by using more layers wet-on-dry, others were accelerating production by reducing the number of layers. The latter became particularly important when working on very large paintings, which were made possible by the widespread introduction of stretched fabric supports – canvases. Prior to the adoption of canvases, the main supports used were wood panels and plaster on walls. Wood panels were not suitable for larger works, and where large altarpieces were required they were divided up into multiple panels. Canvases could be made much larger, remaining relatively light and stable. Painting on woven fabrics had been undertaken since ancient times, but it was really Mantegna (1431-1506) who popularised stretched linen as the support for his distemper (glue tempera) paintings during the latter half of the 1400s. There is also the esoteric satisfaction for the oil painter that they are putting paint bound with linseed (flax) oil onto a support made from processed flax fibre. Venice became the most active centre for much of this development. With its many churches and affluent families, there was great demand for substantial paintings. But its maritime environment – cold and wet in winter, hot and humid in summer – made fresco painting far from ideal. Large canvases proved the best solution, and Venetian workshops geared up for their production. The artists who painted these large canvases steadily reduced the number of paint layers, increasingly painting much of their work in only two or three layers, without glazes. Many became so adept at handling oil paint that they sketched in it too. Thus they arrived at direct painting methods, alla prima, which greatly shortened the time taken. In general, this required more viscous paint, which could still show individual brushstrokes, and was accomplished by the combination of heat thickening of the binder with the addition of resin. Large paintings were less of an issue in the Netherlands, but production pressures and the drive to keep costs down saw a steady reduction in the number of layers in oil paintings through the 1500s. The few layers which were used became thinner and more transparent. Over this period, some artists used alla prima methods, although often with reduction in quality of the painting. Alla prima earned itself a bad reputation, as a result of which many of the painters’ guilds banned it altogether. Bosch’s techniques, studied in detail by the Bosch Research and Conservation Project, were notably advanced for his time. Each of his paintings was started with an underdrawing, usually of a water-based carbon-rich medium applied with a brush. In at least one of his surviving paintings, that was sealed with an isolating layer consisting of a thin application of unpigmented linseed oil. Although sometimes claimed to have worked alla prima (which was not banned by his local guild until long after Bosch’s death), there are usually two or three layers of paint over the underdrawing. For example, he often modelled flesh with an initial thin and transparent layer, over which he laid the modelling using a semi-transparent scumble. 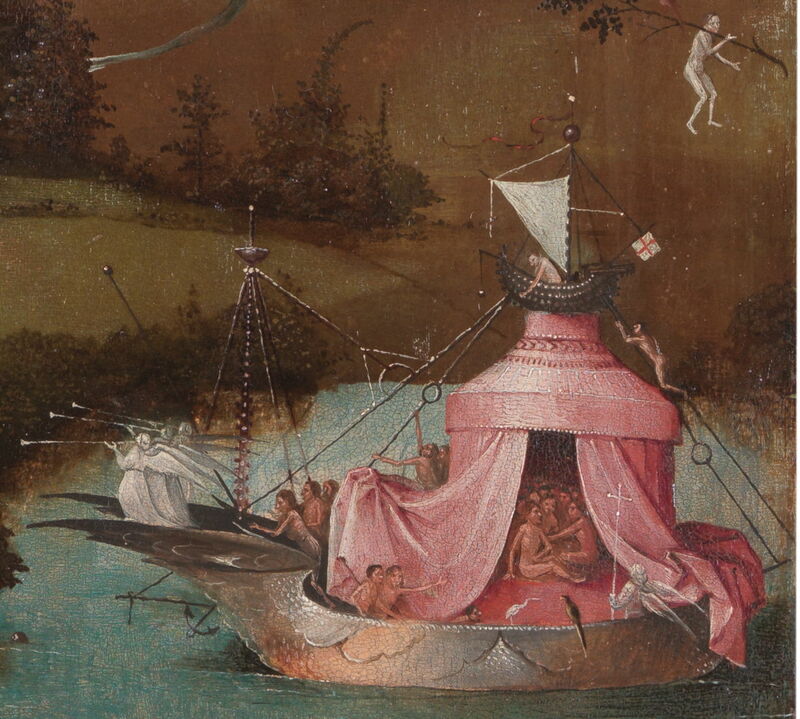 Bosch was also a forerunner in his use of wet-in-wet, with quite frequent passages in many of his paintings. 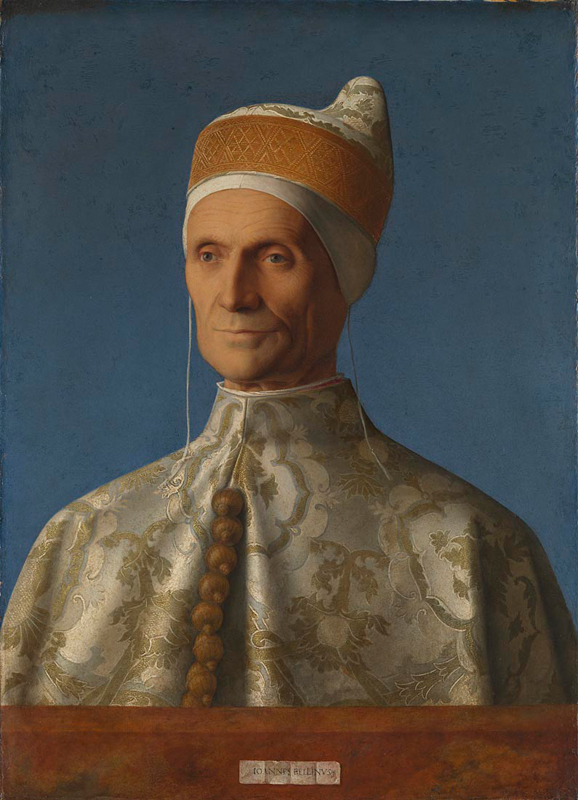 Giovanni Bellini (c 1430–1516), The Doge Leonardo Loredan (c 1501), oil on poplar, 61.6 × 45.1 cm, The National Gallery, London. Courtesy of The National Gallery. 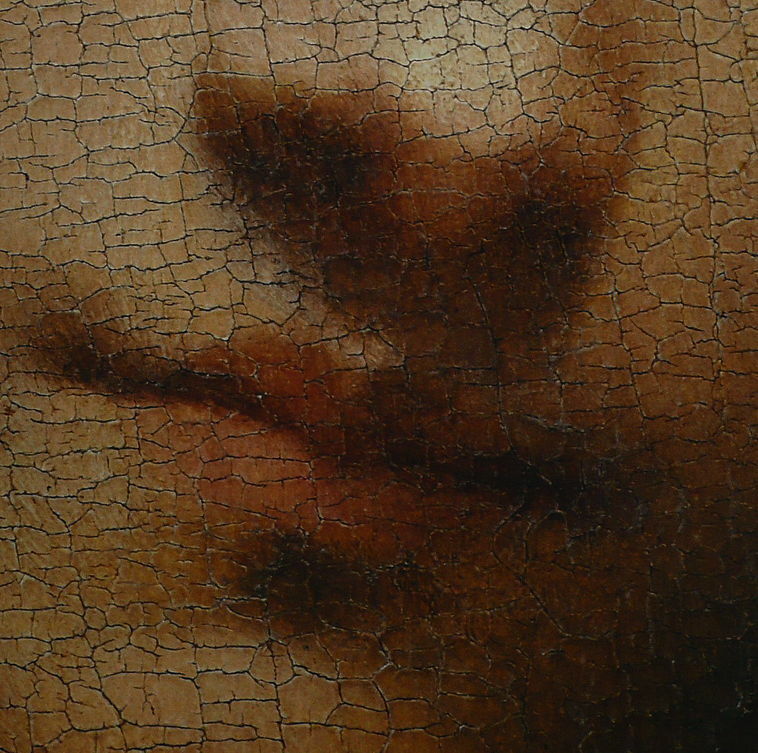 As early as 1501, Giovanni Bellini and Giorgione started to use impasto, initially in fine details of fabrics, metalwork, and jewellery, where those details were applied in the upper layer of paint. 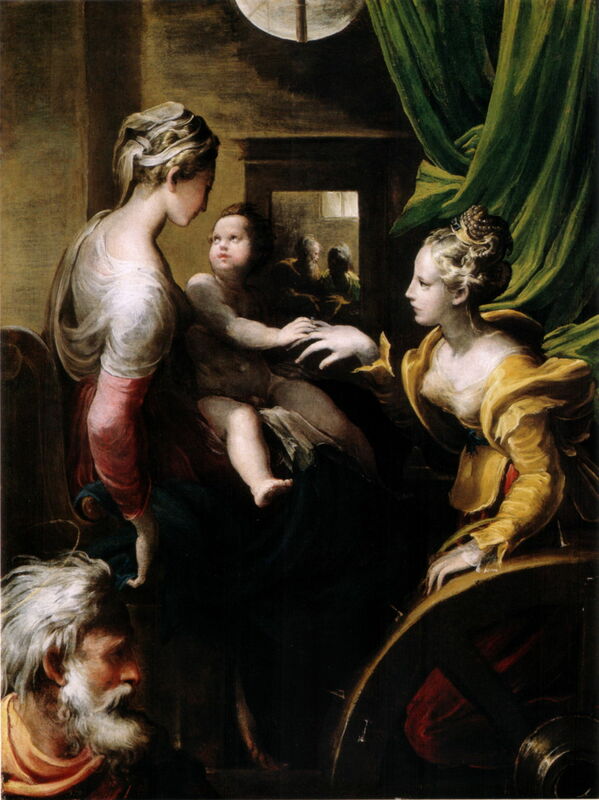 Parmigianino (1503–1540), The Mystic Marriage of Saint Catherine (c 1527-31), oil on wood, 74.2 × 57.2 cm, The National Gallery, London. Wikimedia Commons. Over the next decades, such impasto passages were used by many Italian artists, and found their way to northern Europe by way of Martin van Heemskerck, who visited Rome between 1532-36. 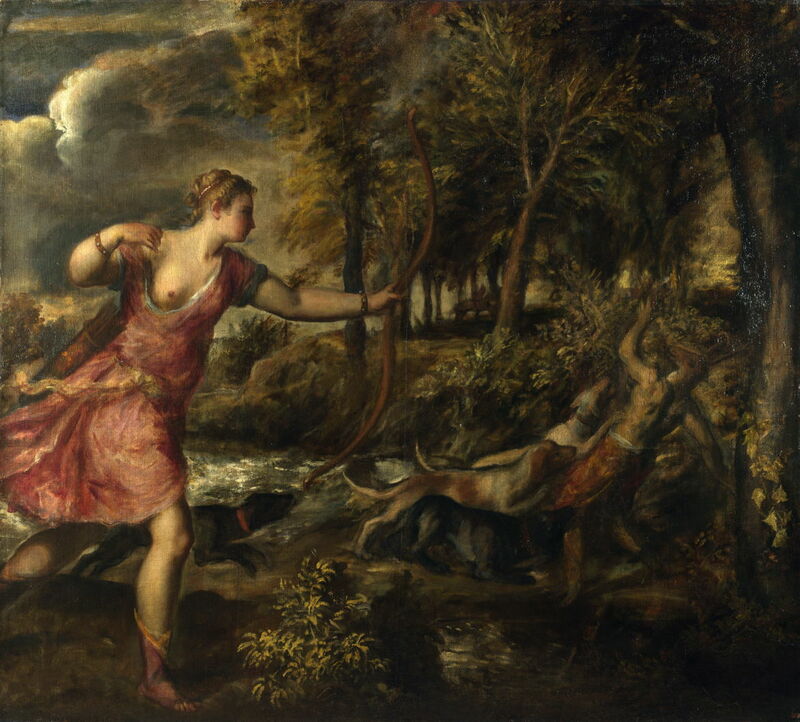 Titian (Tiziano Vecelli) (c 1490–1576), The Death of Actaeon (c 1559-75), oil on canvas, 178.8 x 197.8 cm, The National Gallery, London. Wikimedia Commons. 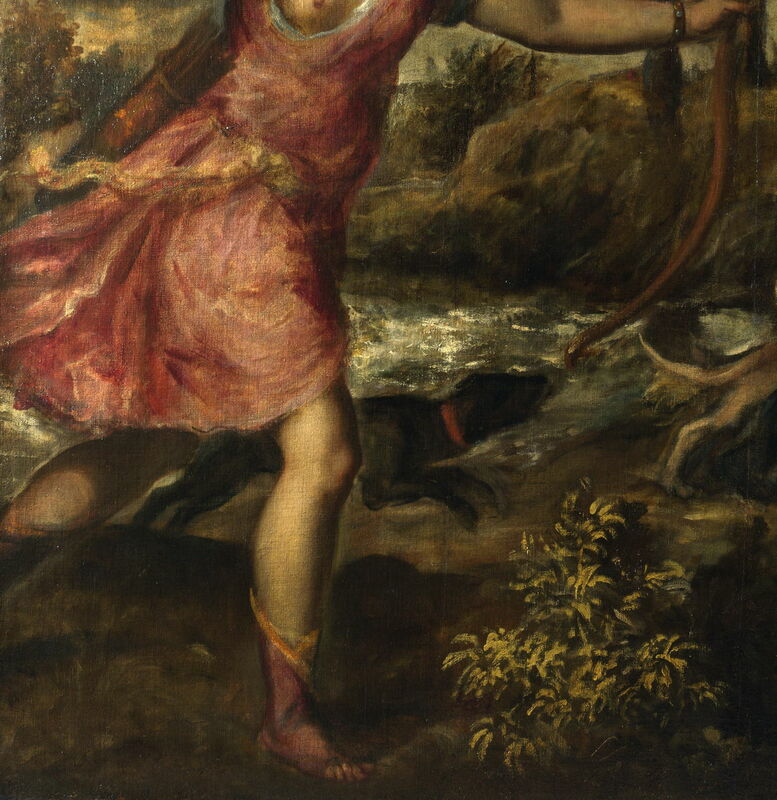 Virtuoso masters like Titian and Tintoretto used a very wide range of techniques appropriate to the work that they were undertaking at the time. Although both generally kept to the use of many layers of glazes, when the time and place were right they were happy to use free brushstrokes to great effect. Veronese, whose largest canvas paintings exceeded 5 x 12 metres in size, started with a layer in half-tone, to establish flesh, draperies, and inanimate surrounds. He then added colours of different shades to build up highlights and shadows simultaneously, rather than layers of glazes. He achieved great efficiency in his work, and saved time, by minimising the number of brushstrokes which he had to apply to achieve the desired effect. When you have an area of over 60 square metres to cover, that made the difference between success and failure. 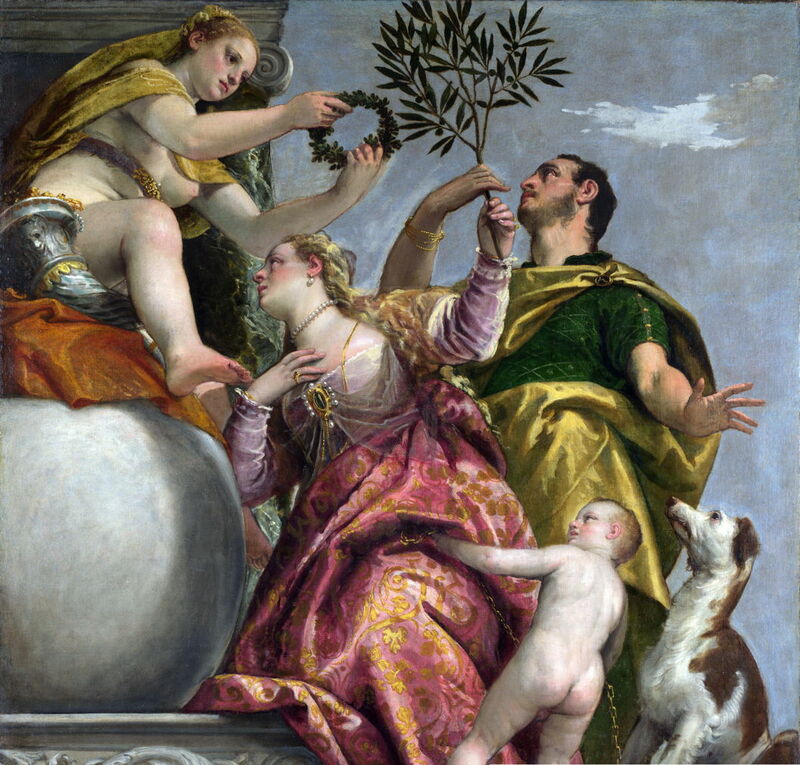 Paolo Veronese (Caliari) (1528–88), Allegory of Love, IV, ‘The Happy Union’ (c 1575), oil on canvas, 187.4 x 186.7 cm, The National Gallery, London. Wikimedia Commons. 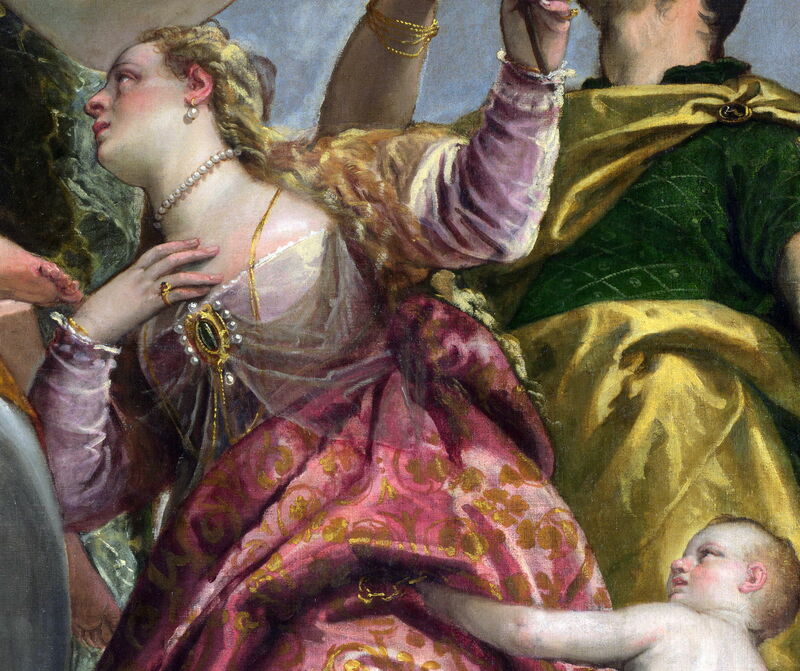 Paolo Veronese (Caliari) (1528–88), Allegory of Love, IV, ‘The Happy Union’ (detail) (c 1575), oil on canvas, 187.4 x 186.7 cm, The National Gallery, London. Wikimedia Commons. Dunkerton J, Foister S, Penny N (1999) Dürer to Veronese, Sixteenth-Century Painting in the National Gallery, National Gallery & Yale UP. ISBN 978 0 300 07220 4. Salomon XF (2014) Veronese, National Gallery & Yale UP. ISBN 978 1 8570 9553 1. 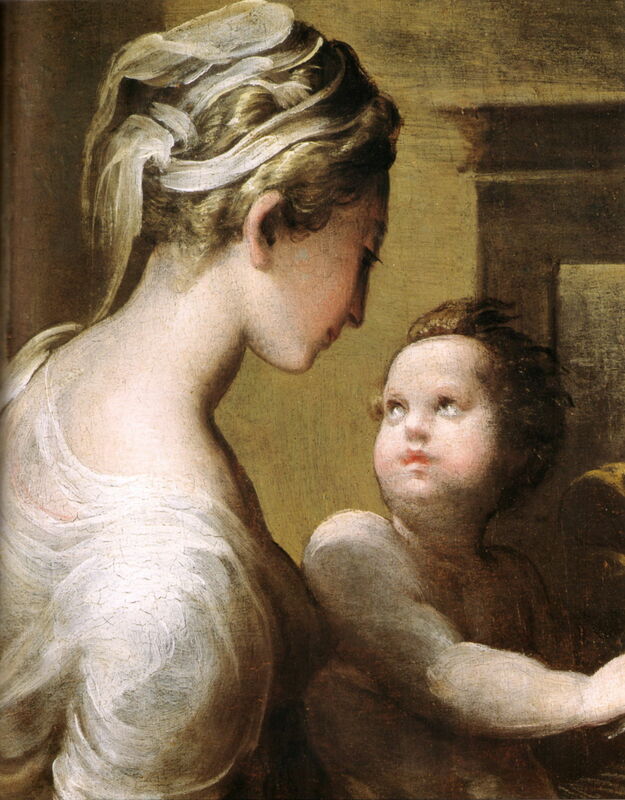 Sohm PL (1991) Pittoresco: Marco Boschini, his Critics, and their Critiques of Painterly Brushwork in Seventeenth- and Eighteenth-Century Italy, Cambridge UP. ISBN 978 0 5213 8256 4. Posted in General, Painting, Technology and tagged Bellini, Bosch, da Vinci, Giorgione, history of painting, oil paint, oil painting, painting, Parmigianino, renaissance, Titian, Veronese. Bookmark the permalink.